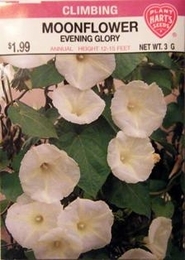 A vigorous climbing vine, producing large fragrant white flowers (often 4 inches or more across) at night. Useful for covering arbors, trellises, porches and tree stumps. Vines will need support when over 12 inches tall. Moonflower seed has a very hard coat and better results will be obtained if the seed is soaked in lukewarm water for 24 to 48 hours before planting. Moonflower thrives in almost any garden soil and blooms all summer.